Lawyer Melih Dikayak who is the member of Izmir Bar Association was sentenced to seven and half years imprisonment with the charge of the member of an armed terrorist organisation by the 2nd circuit of Izmir High Penal Court because of (allegedly) downloading i-message app named Bylock. Since 15 July 2016, 102 lawyers in Izmir have been under criminal prosecution with 42 of whom arrested. So far, 3 members (Feti Ün, Ali Aksoy, Melih Dikayak) of Izmir Bar Association were sentenced ranging 3 and 12 years. I-message app named Bylock has become the most common reason for detentions and (terrorism related) convictions since the failed coup attempt. The US-based think tank Freedom House, which has listed Turkey in his newly released report among the countries in which Internet freedoms are restricted most, stated that tens of thousands of Turkish citizens have been arbitrarily detained for their alleged use of the encrypted communications app ByLock. “Despite a lack of evidence, and the arbitrary nature of the blanket arrests, numerous users have been deemed guilty by association for simply downloading the app.” said the report. The Freedom House is not the only international entity which criticises Erdogan Regime’s purge over the Bylock app. Fox IT which is Netherland based prominent forensic IT company, debunks (MIT) Turkish National Intelligence Agency’s report on BYLOCK app. “The investigation performed by Fox-IT contradicts the key findings of the MİT. Fox-IT also discovered inconsistencies in the MİT report that indicated manipulation of results and/or screenshots by MİT. What is more, Fox-IT found that the MİT investigation is fundamentally flawed due to the contradictory and baseless findings, lack of objectivity and lack of transparency. Fox-IT has read and written many digital investigation reports over the last 15 years. Based on this experience, Fox-IT finds the quality of the MIT report very low, especially when weighed against the consequences of the conclusions.” was said in the statement by Fox-IT after its forensic survey on the Turkish INTEL’s report on BYLOCK app. There has been a relentless campaign of arrests which has targeted fellow lawyers across the country. In 77 of Turkey’s 81 provinces, lawyers have been detained and arrested on trumped-up charges as part of criminal investigations orchestrated by the political authorities and conducted by provincial public prosecutors. 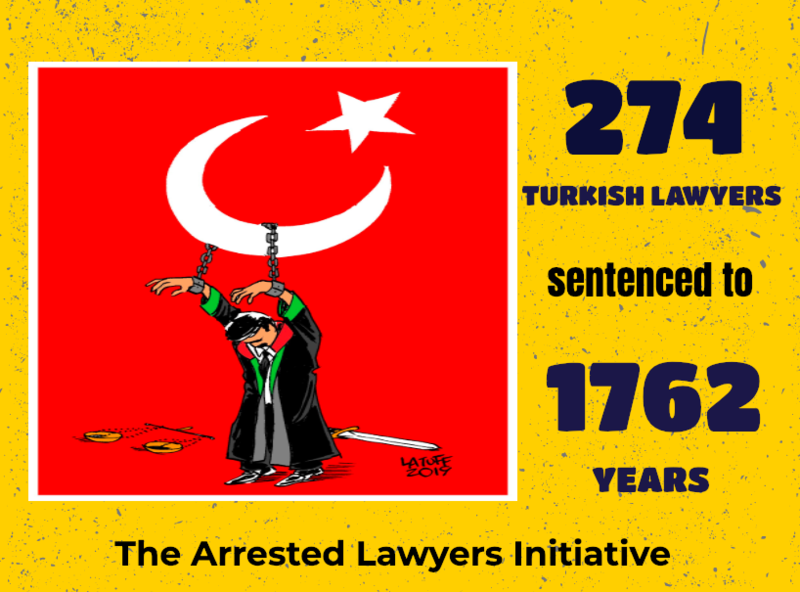 As of today, 568 lawyers have been arrested and 1452 lawyers are under prosecution, 71 lawyers were sentenced to long imprisonment. Some of the arrested lawyers were subjected torture and ill-treatment. 14 of detained or arrested lawyers are the presidents or former presidents of provincial bars associations. In addition to those; Kocaeli, Bolu, Istanbul, Niğde, Kırşehir, Kayseri, İzmir High Penal Courts sentenced fellow Turkish lawyers to long imprisonments.